How can I reduce the cost of groceries? This is probably the most common question I get asked. Personally, health is as important as affordability to me for groceries. While I could get my shopping bill down super low if we based it on rice and pasta, it isn’t healthy. That said, previously, on lean weeks we lived on pancakes, pasta bakes, fried rice, French toast and other things that were easy to make with virtually nothing in the cupboards. I’ll share more below. Groceries aren’t the only part of your food bill. How much do you spend on takeaway food, coffees, cafes and other food related items? In my house, we eat a lot of fresh produce, mainly vegetables, fruit and meat. At times we have stuck strictly to a slow carb diet, other times we ate keto, overall, the focus is vegetables, lentils, and meat. You can read more about my specific tips here with 18 tips for feeding a family of 4 for under $150 a week, including cleaning products and alcohol, plus continue reading below. As part of the 21 day challenge, today I want you to set a budget for groceries and look at how you can implement the tips below to save more money. Go through your cupboards, fridge and freezer then make a meal plan for the week (or longer) using what you already have. Use the food that is going to go off quickly, first. Vegetables looking sad can be used in soups, stews, frittatas, pies, pasta bake, curries, risotto and any other meal where they aren’t eaten plain and on their own. Those random tins can be used in chili, pies, spaghetti bolognese or similar. Beans and lentils can be used to make dahl or stretch mince dishes. If you have flour, sugar or other basics you can make pancakes, crepes, damper, dumplings and a basic pizza dough. If you have yeast as well you can make bread rolls, scrolls and other baked goods. You can check out an old pantry challenge of mine here and a more recent one here. Did you know there are over 20 different meals you can make with a leftover sausage or two? Have you ever thought of turning leftover roast into chicken noodle soup, then turning leftover soup into risotto then the leftover risotto into arancini balls? – Dinner: soup such as pumpkin or Pho, Indian meals such as dahl, chicken tikka masala or butter chicken, cauliflower fried ‘rice’, stir fry or similar. – Dessert: once a week my kids get treats on Friday Family Fun Night of popcorn and ice cream or cake or whatever they choose. Along with the meal planning, prepare meals in advance. Do a cook up on one day and you will thank yourself later. Meals such as soup, bolognese, pies and stews can be cooked then frozen to eat later. Or you can cook double batches on nights you cook and freeze half for later. Seems basic, but do you do it? Write down what you need so you don’t forget anything and need to do two trips and so you don’t buy things you don’t need. Know the prices then shop around, for example, check out your local markets and shop on the day they close. Our local markets clear boxes of food for $5 and meat which is already cheap drops to half price on Sunday afternoon. It takes more time, you will save money though. It is up to you which is more important (time or money) at this stage. Many items get reduced to clear each week so check the clearance sections at your local stores. When items go on sale buy extras to get you through until they are on sale again so you don’t pay full price. – Use scraps to make stock. Carrot peel and tops, celery leaves and other vegetable scraps can be used to make vegetable stock or added with bones to make chicken or other meat stocks. – Squeezed lemons? Grate the rind to use in recipes that call for it and freeze it in ice cube trays then put the lemons in water to make lemon water. – Create ‘bonus’ meals. Strip every piece of meat from the roast and use it for soup, salad, sandwiches, curries, pasta bake, stews and other meals. If you have leftover bolognese turn it into a cottage pie, a calzone, use it on pizza or use it in risotto. Leftover curry can become a pie. Leftover soup can become a risotto. Leftover risotto can become arancini balls. Get creative and turn leftovers into something new. – Stale bread meals. Turn stale bread into French toast, bread crumbs, croutons, bread and butter pudding or use it as a base for pizza toast, mini quiches or a large quiche. Coles, Woolworths and many other places have reward programs. You can sign up to as many as you like, collect points and cash those points in for products or cash. On top of this, you often get specific discounts or extra points offers. With extra points offers, the way to keep it so you don’t have to spend a lot is by spreading your regular shopping. For example, if you usually spend $150 a week, if you spread that between Aldi, your local butcher and Coles and Woolworths, your spend at Coles and Woolworths is likely to only be $40each. This means, an offer to you of spending $100 to get points makes no sense since your usual spending is so low. Instead, they are likely to offer you extra points if you spend $50 each week for 3 weeks or similar. If you spend the entire $150 at one store, they are likely to ‘offer’ bonus points if you spend $175 for 3 weeks or similar. Their aim is to get you to spend more. If you spend less in their store, they give you better offers. Find a list of VIP and Loyalty programs for Australia (not just the supermarkets) here. Also, if you do shop online, make sure you sign up to Cash Rewards and PricePal. You can get money back from your groceries too! It might be easiest to do all your groceries at Woolworths but you will pay a premium to do so. If you check out Aldi, buy only what is on special in the big supermarkets, compare prices and consider co-ops, Costco and other warehouses you will likely save a lot. Add to that, if you have local markets you can save big. Our local market has half price meat on Sunday afternoons as that is when it closes. The prices are already cheap, but this makes it even cheaper. Eggs at the local market are better quality and cheaper too. Takeaway food, coffee and cafes can kill a budget! Takeaway or having food delivered is often $50 to $100. Having 2 coffees every work day at $4ea is $40 a week or $2,080 a year. If you want to budget that in, by all means, do it. It is your money and your choice! – Take coffee from home. Use a thermos to take it with you or see if your work can get a coffee machine. – Make ‘fakeaway’. This is where you have meals you like from takeaway shops but make them yourself instead. We do this and have it in the freezer. Butter chicken, chicken tikka masala, pho (only the broth in the freezer), pizza, garlic bread etc. It works out cheaper to make it yourself and if they are made ahead of time and frozen, it will be quicker one night to reheat than it would be to order and have takeaway delivered! – Use coupons. If you do want takeaway use coupons. For example, use this link to get $5 off with Deliveroo or download Ubereats and use the code eats-kylie591ue to get $10 off your order. 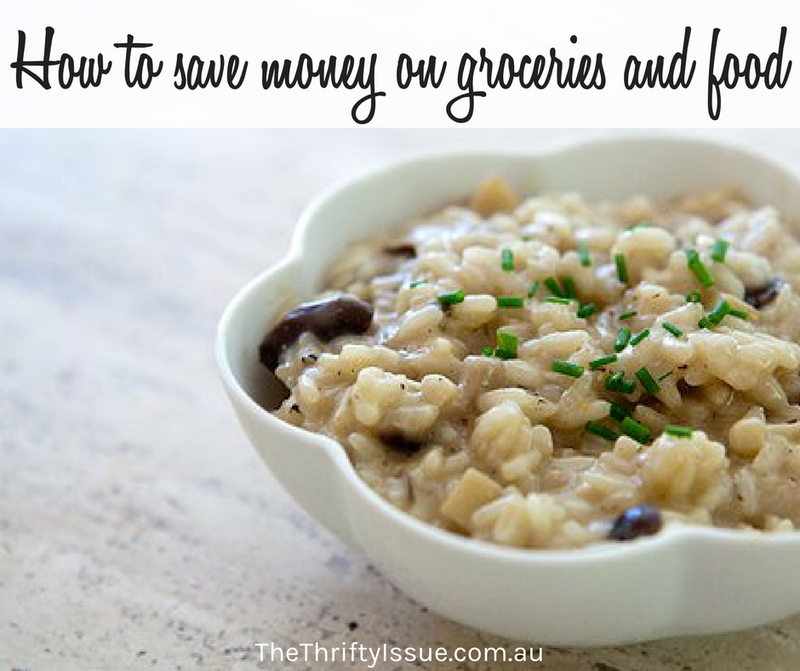 How do you save money with groceries?